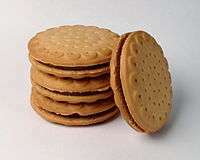 A sandwich cookie, also known as a sandwich biscuit is a type of cookie consisting of two cookies between which is a filling. Many types of fillings are used, such as cream, ganache, buttercream, chocolate, cream cheese, jam, peanut butter, lemon curd or ice cream. 1 2 AARP Betty Crocker Cookbook, 11th Edition - Betty Crocker. pp. 186-187. ↑ Sandwich Cookbook - Larry Randle. pp. 460-461. 1 2 Ms Cupcake: The Naughtiest Vegan Cakes in Town - Mellissa Morgan. p. 120. Cookie Swap! - Lauren Chattman. pp. 109-113.